After visiting this year’s event I came away wondering if this was the time when continuous feed inkjet presses took their place as a creditable replacement for sheet fed offset litho in the most demanding commercial printing markets? First, a digression, ‘continuous feed’ and also ‘cut sheet’ are what the digital press suppliers call web-fed and sheet-fed presses. I think its because they, in the main, came from the office copier market and have not adopted the professional terms used by the printing industry . Still, if this area is now their market, it never too late to change. They should use the terms their market knows rather than impose their own language? So, are these inkjet presses a credible replacement for a sheet fed offset press and the market they address? Like many of the machine on show it has a web width of around 520mm and a maximum of 1200 x 1200 dpi resolution. Speed seems to be around 75/100 meters per minute at its highest resolution. Its maximum speed is 150 meter per minute. From the samples being printed the quality is excellent, comparable with the high-quality offset, due to the small droplet size, high resolution and the wide gamut CMYK inks used by this press. It therefore would seem the colour gamut is at least as large as Fogra 39 and 51 based profiles when using coated papers. Using its SC inks, it can print onto most offset coated and uncoated grade, therefore requiring no precoating. The latest HD+ model has improved drying based on an NIR (near infra-red) system that is claimed to dry the inks without over drying the paper. This press has a web width of 565mm and a maximum of 1200 x 1200dpi resolution. The print speed is 80 meters a minute. Using a precoating system called ColorGrip it can print on most offset coated and uncoated papers, and, off course, inkjet treated papers need no pre coating. Colour quality is very good due the very wide gamut of the Canon CMYK inks. It could even be in excess of Fogra 39 and 51! This press has a web width of 510mm and a maximum of 1200 x 600dpi resolution. The print speed is 50 to 100 meters a minute. Due to its HF (high fusion inks) it can print on most offset coated and uncoated papers without the need pre coat. This press has a web width of 520mm and a maximum of 1200 x 1200dpi resolution. 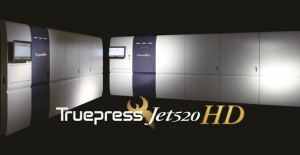 The print speed is up to 150 meters a minute making it one of the fastest presses on the market. It is based on the VC 60000 from Ricoh but uses a new CMYK ink which can print on most offset coated and uncoated papers without the need to pre coated. It also has a new drying system design to reduce paper deformation caused by excess heat. Colour and image quality are very good, the press was running on standard offset coated paper at 120 meter a minute. The colour gamut is said to be close to Fogra 39 and 51 based profiles for coated papers. This HP PageWide T200 series press has a web width of 550mm. Other HP PageWide T series presses, the T300 have a web width of 760mm, the T400, 1060mm. The print speed for the T200 series is up to 152 meters per minute, the T300 and T400 series press have speeds of up to 305 meters per minute, so are one of the fastest in their class. For printing on offset coated and uncoated papers a pre coat is needed. As with other presses whose inks need this approach, this is applied by a unit on the press. The ‘HD’ in the name stands for High Definition Nozzle Architecture, using 2400 inkjet nozzles per inch resulting in very high resolution. So, this results in very detailed images. I have no information on the CMYK colour gamut. This is a web fed press, but very different from the inkjet presses above. It is a dry toner press using their latest dry toner platform, (Cheetah), printing one side only (simplex in digital terms rather then duplex). It was originally aimed at the label market, however at Hunkeler it was printing book dust jackets and coffee table book covers. Colour and image quality were very good, producing very saturated images with a high coverage. I have no information at present on colour gamut. 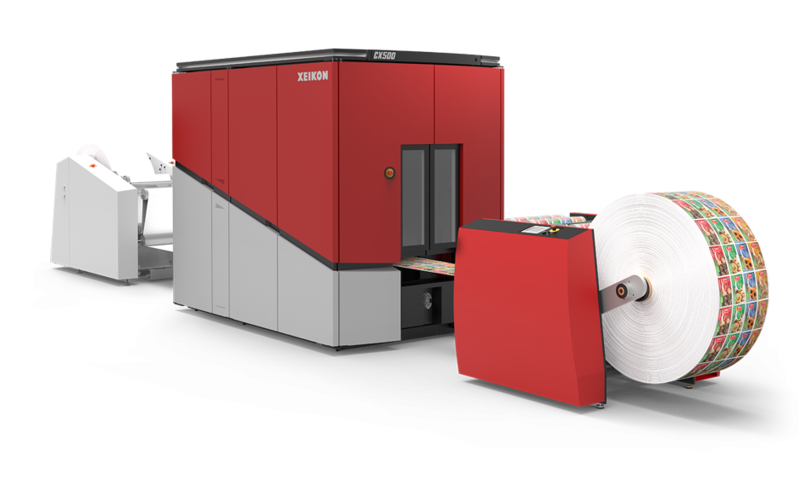 Xeikon do have other presses, such as the Xeikon 9800 which are duplex with similar specifications to the CX500, but possibly not using their very latest dry toner technology. 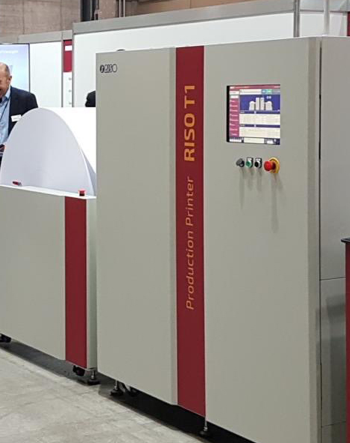 This was a ‘concept’ first shown at Drupa 2016, is press aimed as an entry level, duplex, full colour continuous feed inkjet press, or as a backup to the larger, faster, more expensive presses. Its address’s the lower volume market for transaction/direct mail work on uncoated papers. It has a very small footprint compared to other duplex inkjet continuous feed presses. This is reflected the 600 x 600 dpi resolution and the print speed of 42 meter per minute. The image and colour quality are acceptable for its intended market, with a lower capital cost. It is aimed as the variable direct mail, security and book markets, is rumoured to have a reasonable price point. Image quality for mono printing is very good. The most notable absence at the Hunkeler Innovation Day this year was Kodak and their Prosper inkjet presses. Also, Fuji Xerox were absence, but it was possibly to soon to show their Fuji Xerox 11000, shown below, continuous feed full colour duplex inkjet press in Europe. Based on the same Samba inkjet heads as the Fiji JetPress 720 sheet fed press, it should provide the same 1200 x 1200 dpi resolution and image and colour quality as this press. The web width is around 520mm and the speed at the highest resolution 80 meters per minute. Its inks are formulated to print on offset coated and uncoated papers without any pre coating. Dying is via a heated drum, with an optional infra-red system. This should reduce paper deformation. So, what to make of the varying technical specifications over these many presses? Firstly, if you need mono production then there are a number of continuous feed presses, inkjet and toner, so the choice will be based on your needs for speed, web width and the market you which to address. Areas such as file types you which to process, especially where personalised content and data bases are involved will be important, so the digital front end must match your needs. Do not get too concerned at first re the area of resolution, the presses covered have resolutions varying from 600 x 600 dpi, 600 x 1200 dpi, 1200 x 1200 dpi, even a possible 2400 x 2400 dpi. However, these figures can only be a rough guide to image quality. Other areas such as screening types, inkjet drop sizes etc will all effect the printed appearance. The native colour gamut colour gamut of the press with be important if you need to match to offset litho standards, say ISO 12647/2 or GraCOL G7. So, checking this area could be key. These presses are getting quicker, as was commented at the show, ‘jetting on to paper is not the issue re speed, the issue is drying the ink’. As you can see above some presses can run at high quality at around 120 meters a minute, printing both sides, perfecting as offset printer would correctly term this process. This equates to 10,000 perfected B2 sheets per hour. The first area here is what substrates does your market require, the range of paper and type and weights needed. Some of the presses state they can print on 40gsm to 300gsm. The other very important area is do you wish/need to print on standard offset coated and uncoated stocks? These are much less expensive then the pre coated inkjet papers which can be twice the price. Many of these presses can print on offset stocks either by pre coating on press, or more recently, using inks that need no pre coating, so saving both on paper coats and the costs of the precoat on press. Most of these presses have a web width of around 520mm, so most of the inline and off line finishing systems for these presses are aimed at this size. HP do make a number of presses with larger web widths. Also, Canon and Xerox have smaller web and cut sheet inkjet presses. So always, the decision to purchase needs to be based on your market and volume requirements. So, a complicated area, but it now seems that continuous feed inkjet presses are firmly in the high-end commercial colour market, after moving from the transactional areas, and then into direct mail and books. Now with the ability to print on most coated and uncoated offset stocks without the need to pre coat, using resolutions, drop sizes and screening which give offset quality, and the also speeds increasing close to sheet feed offset, they make the purchase of the next press an interesting decision for printers in many markets.